Curry is a broad term that describes many different dishes from Indian cuisine. Curry uses many different spices and almost always is a type of sauce containing meat or vegetables. Our garlic and egg curry recipe is unique because it uses hard-boiled eggs instead of the meat or vegetables. However, you’ll still get that delicious curry taste with all of the aromatic spices the recipe uses. The recipe is a great vegetarian option, as the rice and egg will give you lots of energy. If you’re tired of repeating the same few recipes again and again, this is a great dish to try! It’s sure to spice up your dinner schedule, and your whole family will love it. With four servings, it makes the perfect amount for your family or can be tasty leftovers for you and your partner. Once you make this recipe once, be ready to make it again! After just one bite, you’ll know you want this dish again soon. 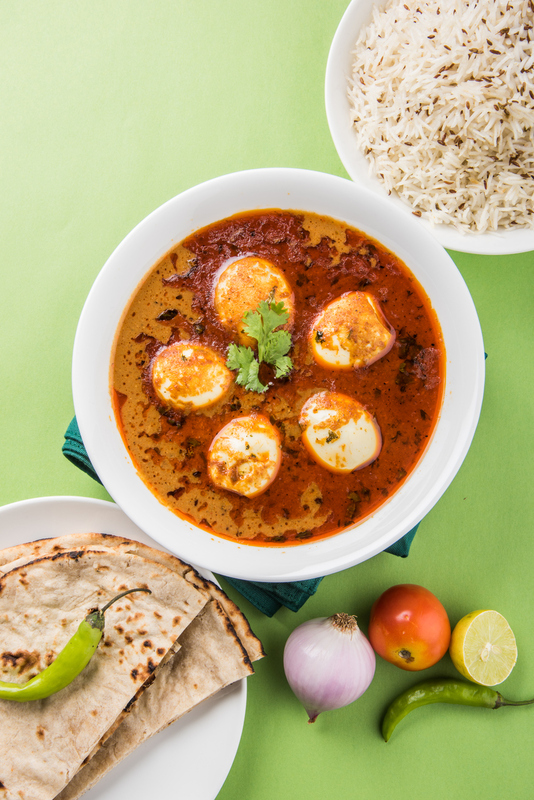 To learn how to make homemade egg curry, see our recipe below! Cook the rice according to the directions on the packaging. Begin the next steps while the rice is simmering. Heat the oil in a large skillet over medium to medium-high heat. Add the basil leaves, onion, and poblano chile. Saute until the onions become tender. Add the ginger, garlic powder, and cashews. Stir until evenly combined and cook for about two minutes. Add the tomatoes and cook, stirring until all the ingredients are well blended. Add the turmeric, chili powder, garam masala, coriander, and salt. Stir until all the spices are well combined, and the curry becomes fragrant. Cut shallow slices in the hard-boiled eggs and add them to the curry. Cook it for about two minutes, stirring gently. Add the water a little at a time until gravy forms. Cover the skillet and let it simmer until the sauce thickens — about two minutes. Stir in the coconut milk until combined and heated, about one to two minutes. Remove the curry from the heat and serve over rice. When making this egg curry recipe, be sure to use Sauder Eggs. We partner with farmers that agree with us — you should feed your family food using the best-quality ingredients possible. Our eggs will make this recipe even fresher and tastier. Find your nearest store that carries Sauder Eggs today by using our store locator.